In total, around 60 people have died on Half Dome and the trail leading up to it. 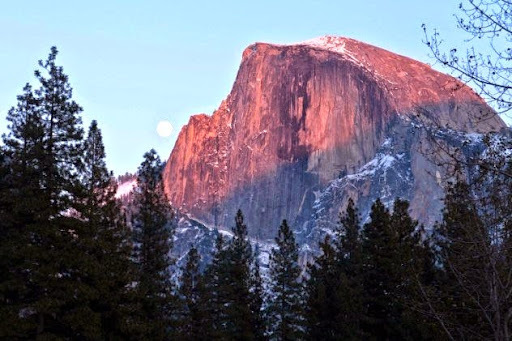 Hiking up Half Dome takes an entire day, during which you'll climb over 1,500 meters (5,000 ft), burn anywhere from 4,000 to 9,800 calories, and climb the last 120 meters (400 ft) nearly vertical with the assistance of metal cables. And that's where many of the problems start to occur. Hikers are discouraged from undertaking the climb when conditions are wet, because the combination of slippery cables and slippery rocks can be deadly-so deadly, in fact, that the bottom part of the cliff on the same side as Mirror Lake is known as the Death Slabs. Even when it's not wet and slippery, accidents are still well documented. In 2012, a man slipped from the cables and had to be rescued after trying to grab a radio dropped by a person above him. Deaths of 2011 include three hikers who ignored guardrails and fell into Vernal Falls, another man who slipped and fell onto the Mist Trail (ultimately swept away and killed by the same river), and a 26-year-old who slipped on the cables and fell 180 meters (600 ft). Falls and drowning aren't the only dangers. There are also records of hikers being struck by lightning while attempting to make the climb. The Yosemite Search and Rescue team estimates that about 60 percent of their duties involve rescuing hikers in distress. They rely not just on helicopters for rescues and preparedness for medical emergencies, but also on canine search and rescue and swiftwater rescue teams.